Many patients clench and/or grind their teeth at night and often times do not even know it. Your dentist can see the signs of clenching and grinding during a full exam. Signs include: flat teeth, broken teeth/fillings/crowns, missing teeth from fractures requiring extractions, gum recession with loss of enamel at the gum line, and jaw pain. This can lead to severe, long-term issues, including needing extractions, crowns, multiple fillings, and gum problems. Why Choose 21st Century Dental for Nightguards? Wearing a protective mouthguard/nightguard every night is a good way to prevent destruction of your teeth. It allows you to bite into acrylic instead of tooth. Acrylic is softer than enamel so your teeth should not further flatten or break if this habit is occurring nightly. 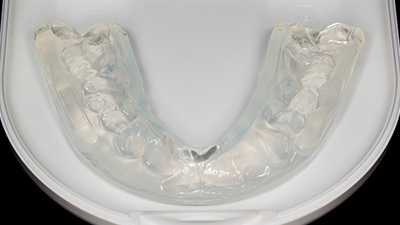 Nightguards are a conservative, effective way to protect your teeth from damage. Ask us about getting yours today!